Getting information out to buyers is quick, easy, and great for follow up. The perfect tool if you are trying to sell your home without an agent! See... it doesn't have to be so hard. 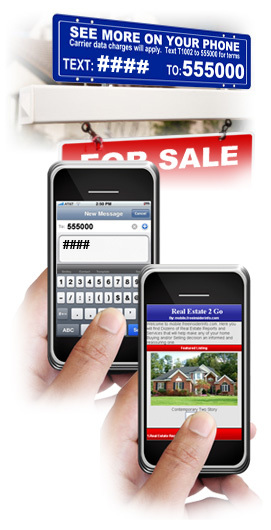 You see, many of our homes are already online and can be accessed immediately by punching in a simple text message. Buyers can drive by your home for sale and see the property details and photos right then and there. And it's really easy and convenient for buyers too. You can send a text message anytime, day or night, and never have to speak directly with an agent or buyer (unless of course you want to). You can imagine how much time this saves you, and get a better idea of how many buyers are looking at your home. For more information on this unique program, please fill out the form on this page.